One of California’s premier wine-producing regions, Monterey County has beautiful scenery, upscale galleries, glamorous resorts and stellar local wines. Monterey County is one of California’s premier wine-producing regions, but it also has long been a destination for travelers. 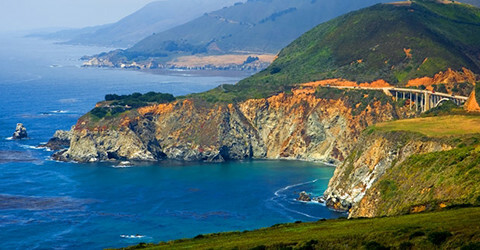 It has beautiful scenery, including Big Sur, the 17-Mile Drive and the Pebble Beach golf courses. It has the tourist venues of Cannery Row and Fisherman’s Wharf. It has the upscale galleries and bistros of Carmel-by-the-Sea. In short, Monterey has diverse draws for wine-oriented visitors. Glamorous resorts dot the county, featuring world-class cuisine, stellar local wines and full spas that pamper with style. The city of Monterey is only about 100 or so miles from downtown San Francisco, making it an easy detour for a multiday trek. When Restaurant 1833 opened in downtown Monterey, it instantly raised the city’s culinary reputation. Located in one of California’s oldest adobe buildings (hence the name, which honors the year in which the structure was built), it offers fresh, skillfully crafted cuisine and a wine list so extensive, it has been described as an auction catalog. The cocktail selection is easily the best on the Monterey Peninsula. The atmosphere is lively, crowded and happy, with most entrées coming in around or above $25. The chic Monterey Plaza Hotel & Spa is conveniently located on Cannery Row in the city of Monterey. Many rooms have expansive views of Monterey Bay (and sounds, too—the crashing of surf, the barking of harbor seals and sea lions). A Taste of Monterey on crowded Cannery Row features the offerings of over 85 local wineries in a tasting bar-type setting. It’s the perfect place to sample the best of Monterey, especially if you’re staying nearby and don’t want to drive. For individual winery visits, start with Morgan. The tasting room is in Carmel, and you can sample a wide range of reserve and regular Chardonnays, Pinot Noirs, Syrahs and other wines from this well-regarded producer. Talbott Vineyards offers some of the region’s most complex Chardonnays and Pinot Noirs at its location on the River Road Wine Trail, which winds scenically along the base of the Santa Lucia Mountains. Chalone Vineyards is a true pioneer in California Pinot Noir. Its tasting room is way up in the Gavilan Mountain Range, above Soledad, east of the 101 Freeway. September and October offer the driest, sunniest weather, with rain more likely as November nears. Monterey has a relatively cool climate, so its signature varieties are Pinot Noir and Chardonnay. Dependable producers include the Testarossa Winery, Pessagno Winery, Roar, Morgan, Pisoni and Talbott Vineyards. Cool-climate Syrah abounds, too, from the likes of Novy Family Wines and Wrath. While most of the county is too cool for Cabernet, the warm Carmel Valley, sheltered by the Santa Lucia Mountains, features elegant, earthy Cabernets from Bernardus Winery and Galante Vineyards. A particularly successful small region is Arroyo Seco, nestled on the west side of the sprawling Salinas Valley. It’s known for crisp, inexpensive red and white varieties. Insider tip: Wines with a Monterey or Monterey County appellation can be extremely good values, so if you’re in the market, be sure to scoop up a few cases. Dig into the famous Ambrosia Burger with a sauce that includes chili salsa, for $14.50, at Nepenthe in Big Sur. Wash it down with local wine on the outdoor deck while enjoying fabulous views. Take a drive, with the top down, on Highway 1, which boasts one of the most gorgeous drives on the planet. The winding two-lane highway hugs the coastline and offers unsurpassed vistas of the majestic Santa Lucia Mountains and the deep-blue Pacific. Head south out of Big Sur and in minutes the relatively pricier convertible rental will pay for itself.